If you were born between November 22 and December 21, you may be considering a Sagittarius tattoo design. There are several ways to wear your sign on your sleeve or anywhere else you'd like. Zodiac tattoos are especially easy to wear because, depending on the style you choose, you can make them as big or small as you'd like and as easy to conceal as necessary. The typical Sagittarius personality is honest, extroverted, overly optimistic, moral, adventurous, active, independent, and often side with the underdog. They are natural teachers, philosophical thinkers, and do well in careers in law, church, public relations, advertising, and other fields that allow them to travel, explore the world and ideas, and inspire other people. They are intelligent and tend to exhibit good judgment. 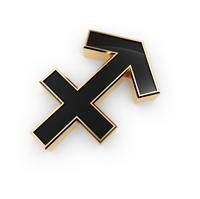 The Sagittarius has so many good qualities to boast of (even though the typical Sagittarian is quite modest! ), who wouldn't want to get a zodiac inspired tattoo, either as a focal point or at least as part of another, larger tattoo? There are several ways to demonstrate just how proud you are to be a Sagittarian. Use arrows, a centaur, words, and more. The centaur, half man and half horse, is associated with Sagittarius because the constellation resembles a centaur with a bow and arrow, and also because the centaur represents man's dual nature-the human (intelligence) and the animal (physical). In many cases, the centaur is holding a bow and arrow. Sometimes the centaur appears as just a man, since several tattoo designs only show him from the waist up, bow and arrow in hand. Styles for arrows and centaurs vary; some tattoos look like they were taken straight from photographs, some are inspired by tribal tattoos and are done in black ink only, others are examples of beautiful fantasy art. The most commonly used symbol in Sagittarius tattoos is the arrow. It's a standalone arrow that points northeast and has a perpendicular line across the back. The arrows do not all look the same. They can be elaborate, simple, tribal-inspired, and more. The colors can vary. The arrow is a good option for the Sagittarian who wants a tattoo that can be discreet, easily any size he desires, and can be personalized with words, images, colors, style, and more. Some Sagittarius tattoo designs simply say "Sagittarius" in an interesting font. Additional details like an arrow, flowers, or a moonstone can be added for a complete and personalized look. In some cases, just the letter "S" is enough to symbolize the zodiac sign. Some simply show drawings or designs while other sites show the tattoos on skin for placement and size ideas. In some cases, seeing the tattoo on the skin may help you visualize how your variation will look in a certain spot. By inspecting others' designs and tattoos, you'll see there are so many Sagittarius tattoo designs out there, it might be hard to pin down just one style you'd like.